(Originally published at Revise & Resubmit; reprinted with permission). For many years, I had been somewhat wary of studying and picking apart a writer or subject from which I derived a personal, rather than an intellectual, joy. In this category, the literature and history of the First World War was perhaps the subject which I was most protective towards. With fears that a critical examination might expose both its simplicity and naïveté and, dare I say it, its immeasurable spirituality, that it was both above and beneath scrutiny, I had held it back from the critical grinding of the scholarly machine. As an aside, it is the same rationale that has made me reserve a special place, far from the academic light, for P.G. Wodehouse and all his works — though I secretly believe that he would more than withstand the slings and arrows of any outrageous theory. Quite how and why I have had, for as long as I can remember, such an interest in the Great War, I don’t know. I have family connections with the conflict, as have most, but my desire to understand the experience intimately and from the inside went far beyond wanting to know the particulars of the parts my ancestors played. So Hynes’s intelligent, meticulous and measured monograph became something of a model for me, not just in the scholarly approach but also, when I reverse engineered it, in his underlying research practice. Hynes does not dismiss the leading lights of First World War literature, he adequately examines Sassoon, Owen, Brooke, Graves et al, but moves pretty quickly beyond the poetry and the pity of war that has come to so define it. He shows that a multitude of servicemen on all sides were, through literature, trying to comprehend their place in the conflict for themselves and for their own sense of posterity. These were the books I wanted to read. Picking up the volume recently, I realized that its principal value for me today is in providing an excellent bibliography of less well known war novelists and memoirists, most of which I’ve read now. But I only got to know about them, and to have a model for how to study them, thanks to Hynes. A.P. Herbert is not an undiscovered soldier-poet of the First World War. He published during the war, he wrote some excellent books after it. 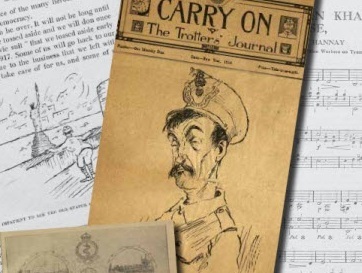 But I first found him through the magazine The Mudhook: Journal of the 63rd Royal Naval Division, which was written and published by the men of the Division while on active service in Gallipoli and on the Western Front. That was a fresh discovery and one that came about, as fresh discoveries so often do, more by luck than by design. After six months in Cambridge, working towards my PhD, a librarian idly mentioned that I should look at their so called “War Reserve Collection." I duly did. The Collection, I learned, is just the sort of hidden gem in a multitude of larger, rarer, more valuable hidden gems that an 800-year-old University Library tends to specialize in. It was assembled during the War by the then-University Librarian who felt it his duty, rather than to satisfy his personal interests, to collect “for the benefit of future historians” the ephemeral literature (pamphlets, leaflets, magazines, flyers, posters) that were then being produced and were likely to fall outside of the collections policies of scholarly libraries. That Francis Jenkinson, the University Librarian in question, had that impulse was the making of my PhD. Amongst the War Reserve Collection’s holdings are about 900 “Trench Journals”; magazines that servicemen wrote and illustrated, had printed privately and distributed or sold for a nominal fee to their comrades. To us now, they are the magazines of closed communities, and not just because those communities are long gone. They are full of in-jokes, lost references and hard to interpret accounts. But for all that, actually because of that, they are hugely valuable to researchers today. These magazines form the missing piece of primary sources of the First World War. We have memoirs, poetry, novels, letters, diaries, government documents, newspaper reports, official newsreels and interviews. 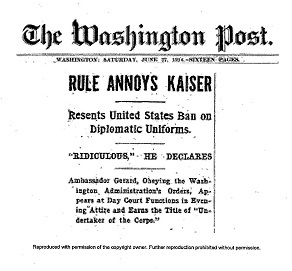 But what we lack is the voice of the soldier, speaking to his comrades, without having to consider a contemporary (or subsequent) civilian readership. But thanks to Francis Jenkinson’s efforts, I was able to read every one of the War Reserve Collection’s Trench Journals. Inevitably, there is some poor poetry, poor drawing and poor writing generally. But it all carried weight. It all meant something to the serviceman or woman who put pen to paper to amuse, divert or inform his or her comrades. But Herbert and The Mudhook, as well as hundreds of other examples, changed that. The poem conveys the sense of the generational strata that occur in a front line unit due to the fortunes of war and the decimating effect of battle. As Herbert’s unit find themselves camped in the site of a previous battlefield, he takes to wondering about the identities of the living and the dead. The unit here is made up of the living who remember, the dead who cannot forget, and the newcomers who have no history of this particular place. It made me realize that remoteness and the sense of closed communities, of exclusive badges of honor awarded for experience of place as well as danger, existed during the war, within a unit. The character of the soldier was defined by that experience and those soldiers who died, and remained in a place perpetually, retained their identity perpetually. Even the survivors would leave the front line and, Herbert’s poem suggests, there will be an odd remorse at that. Trench Journals are, in some ways, the exception to the rule; they retain their identities, keep their communities closed, whether they are on the Western Front, in the War Reserve Collection, or in ProQuest’s Trench Journals and Unit Magazines of the First World War. The moment of change, of when and how war turns to peace, fascinates me. Of course, the First World War ended with a whimper and not a bang; the Armistice was concluded and decided upon by the signing of a scrap of paper, in an isolated railway carriage deep in a forest and not claimed by the fighting men in a glorious victorious charge. The form that the victory took – and an Armistice is not a Peace, that took a further seven months to hammer out – determined, I believe, the commemorative acts that came to define the remembrance of that War. 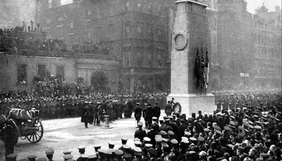 On the first anniversary of the cessation of hostilities, 11 November 1919, a wood and plaster Cenotaph, to Edward Lutyens’ design, was erected in Whitehall to act as the secular centerpoint to the day’s events. At that time, the chief aim was to celebrate the hard won and justified victory. That a cenotaph, literally an empty tomb, was chosen as the locus of that “celebration," combined with its simple inscription “To Our Glorious Dead," embodies the contradictions that swirl and eddy around the monument. The Cenotaph was never meant to be a permanent monument. But such was the public response that the wood and plaster version was replaced with an identical one of Portland stone in time for the second anniversary in 1920. The image shows that second anniversary when the two most iconic physical representations of the Nation’s sentiment and memory of the War were in close proximity for the first and last time. On the left of the image, bedecked in the Union Jack, lies the casket holding the Unknown Warrior that went on, following this moment of meeting, to Westminster Abbey where it was interned in the nave, near the entrance, positioned and honored such that all whom enter the Abbey, from King to caretaker, must alter their step to avoid treading upon its black, engraved tombstone. More interesting than the facts around the selection and transportation of the Unknown Warrior himself (he really is not so unknown after all) is that he is interned in soil taken from the battlefields of France and Flanders which had been packed into dozens of sandbags and sent back to London alongside the Warrior. The Tomb is not just that, as Brooke put it, of a “A dust whom England bore” but more profoundly of “some corner of a foreign field” itself. The memorial serves as a repatriation, certainly, but, more significantly, it is the patriation of the sacred soil of the distant battlefields. The Cenotaph, in its architecture as well as in its symbolic meaning, similarly drags the conscience, then as now, away from the physical place it occupies. The monument’s vertical lines are not straight. They curve almost imperceptibly to create a displaced center. An empty core, as empty as the tomb that sits diminutively at its physical apex, is indicated deep below the monument. I suppose both of these hugely significant and suggestive objects in this image, as well as the unphotographable Two Minutes Silence that was also invested at much the same time, combine to suggest a Nation in a vast amount of unacknowledged denial and emotional confusion. On the surface, this is a photograph of a victorious, proud, resilient people. Yet there are no flags waving in celebration, just the mournful, weeping willow standards on the Cenotaph and the one draped over the casket. A casket containing the dead body of the man that has come, in this moment, to represent the loss of a Nation, perhaps even of every combatant nation and, I would contend, of the Twentieth Century as a whole.